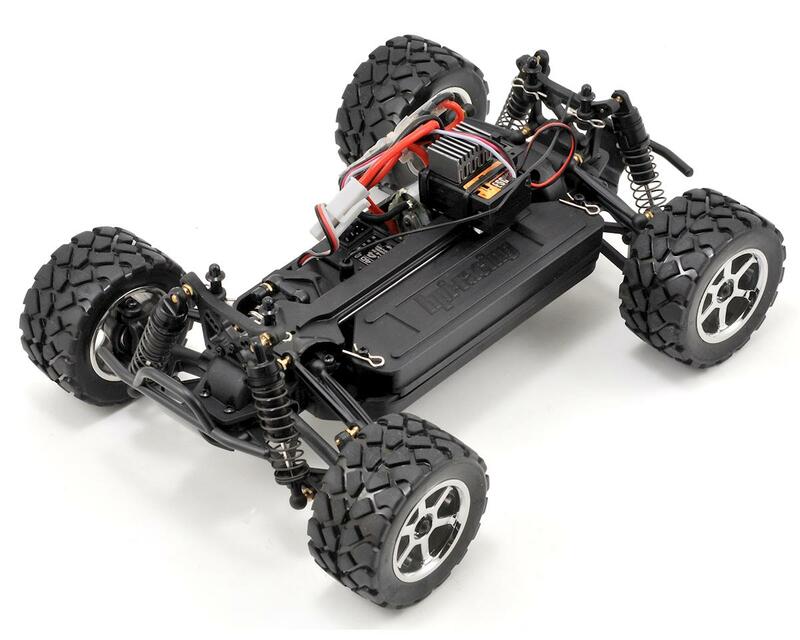 This is the HPI Mini Recon Ready to Run 4WD Electric 1/18 Scale Monster Truck. 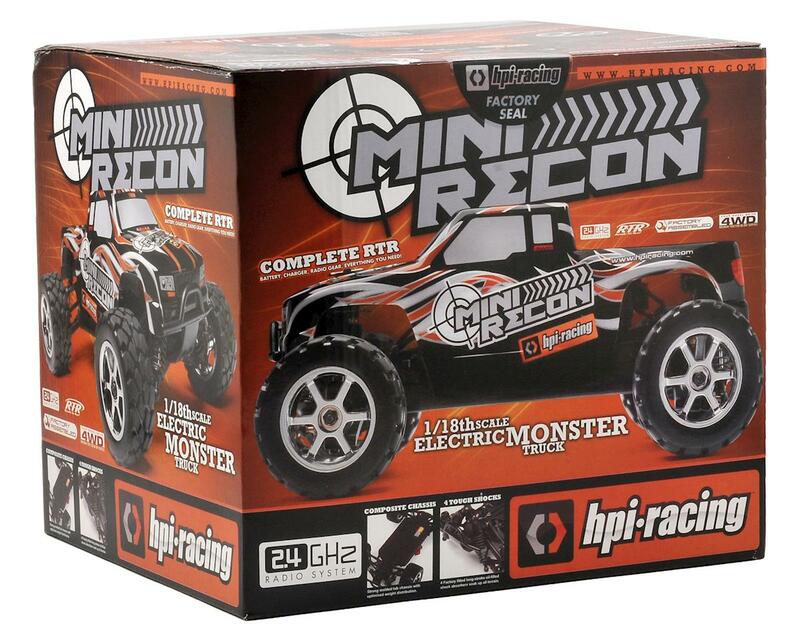 The HPI Mini Recon is the perfect 1/18th scale fun package. Made from extremely tough composite material the Mini Recon is nearly indestructible. 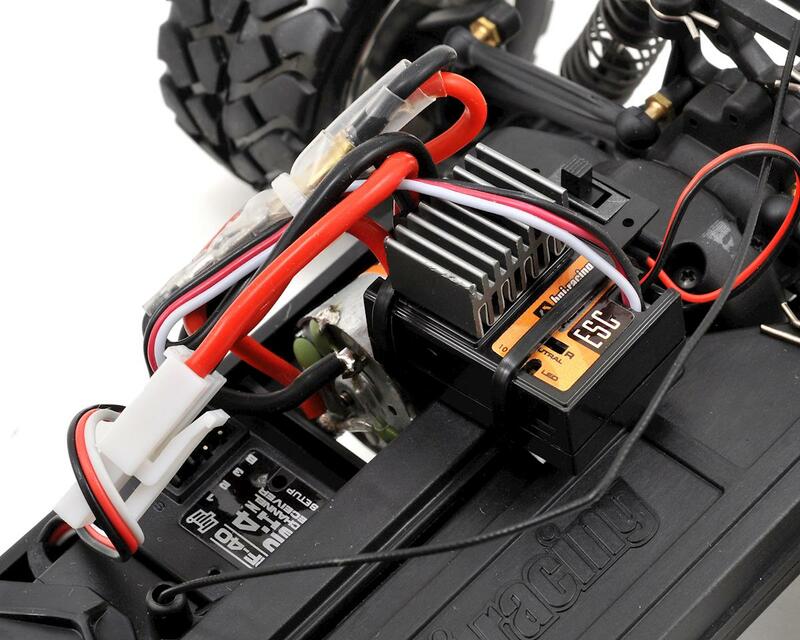 Its powerful 370 size motor accelerates the Mini Recon to incredible top speeds. 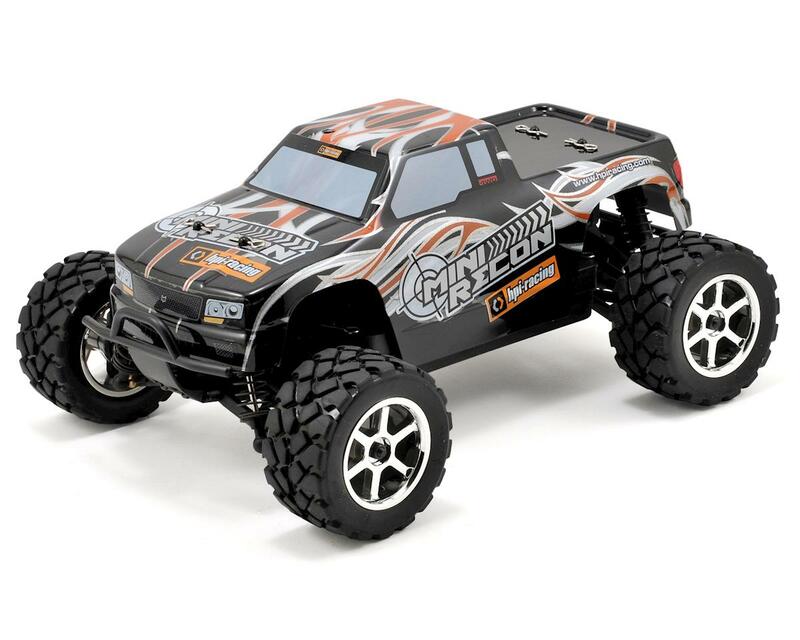 The Mini Recon comes as a true RTR package with absolutely everything you need to get going, including: HPI TF-40 radio set, 7.2V NiMh battery, charger and even AA batteries for the transmitter. 2.4GHz: HPI TF-40 2.4GHz radio set for trouble free control. SHAFT 4WD SYSTEM: Heavy-duty 4WD shaft drive system to handle the High Torque RM-18 motor power. RSC-18 ELECTRONIC SPEED CONTROLLER: The High Frequency forward and reverse RSC-18 ESC provides all the power you'll need. RM-18 HIGH TORQUE MOTOR: High torque brushed motor gives the recon great performance both on and off the road. BALL DIFFERENTIALS: Super smooth ball differentials provide reliable power transfer. SUSPENSION: Fully independent double wishbone suspension. 4 TOUGH SHOCKS: 4 Factory fitted long-stroke oil-filled shock absorbers soak up all terrain. SERVO SAVER: Twin point steering with integrated servo saver. BATTERY COVER: Covered battery for extra protection. FULL BALL BEARINGS: Fully ball raced, efficient drivetrain. 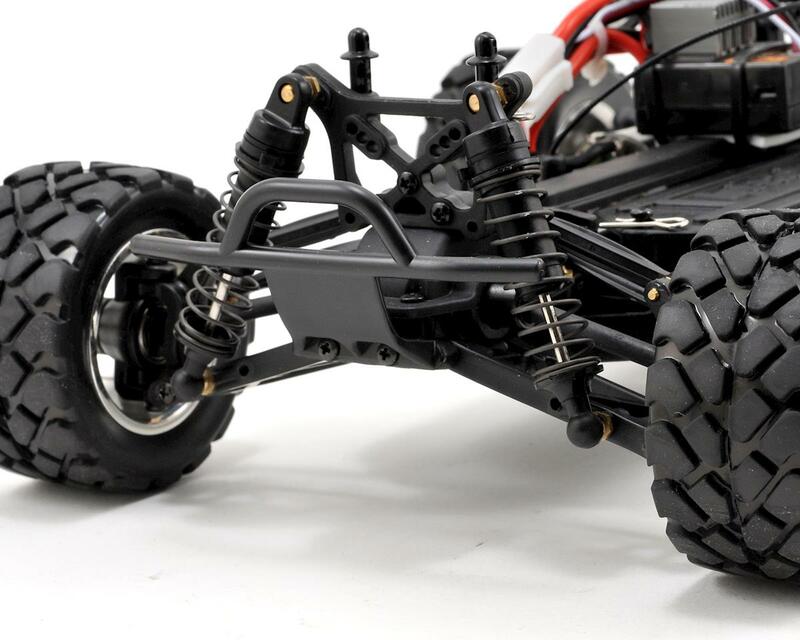 COMPOSITE TOUGHNESS: Strong molded composite tub chassis, shock towers and suspension parts make the car nearly indestructible. MICRO BLOCK TIRES: Pre-glued high grip "Micro Block" tires on Chrome 6 spoke Rims. PAINTED BODYSHELL: Pre-finished and trimmed bodyshell, fully finished from factory with applied decals. Nothing! Everything you need to get started is in the box! 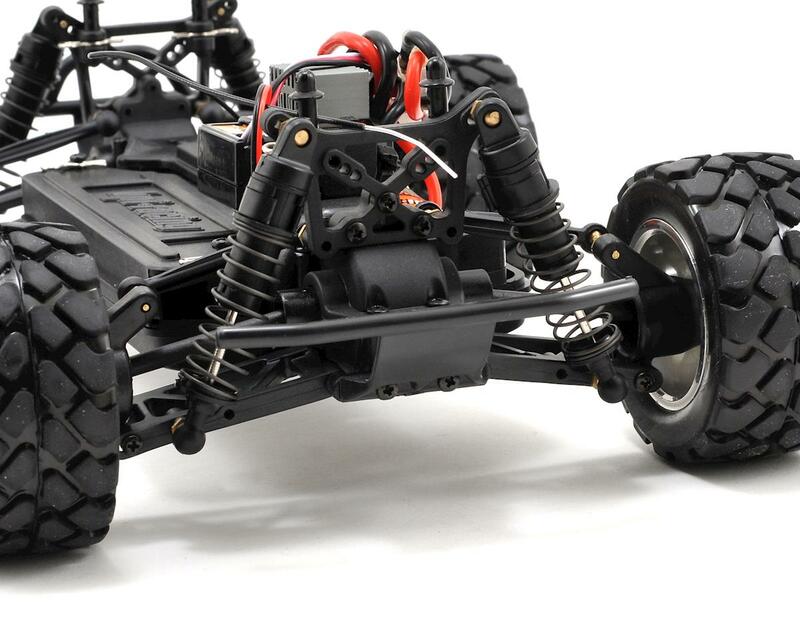 This is a great little monster truck, I am very pleased with it except for on thing. The Rims a very weak and crack alot. The outer rim broke off the offset, I can't seem the find wheels anywhere(sold out) for it since it is so new. Other than that I love this thing and think its the best buy I've had! Great little truck for first time rcers and up. It comes with everything you need (tools, battery, charger, car radio and manual) to get started. Ball differentials are fantastic, and it's pretty fast. My only complaint is the wheels cracking easy (upgrade to rc18 wheels and tires) or glue the cracked parts with ca, it works, and it's not the easiest to get parts for, but most (if not all) hobby shops said they can order the parts. But, you also have the internet at your disposal and can find them with a quick Google search. Most parts are compadiple with the rc18t/b/my 1, don't even try with the 2's. The one thing that isn't (I think the only) is the spur gear. Then associated uses a hex patterned spur while the recon uses a pined spur. But, an associated drive shaft is about $6, or you can cut a grove into an associated and stick it on the pin. Then associated motor plate also requires some modification to make it identical.